In part 2, we discovered that a embedded controller update is performed by uploading a small ‘flasher’ program to the EC. This flasher program is then responsible for programming a new firmware image to the EC’s internal flash memory. However, both the flasher program and part of the firmware image are encrypted: the old (currently running) EC firmware decrypts the flasher program, and the flasher program then decrypts the new firmware update. This creates a bit of a chicken-and-egg problem that prevents discovering the encryption algorithm from firmware update files alone. Now normally the first stage of Blowfish, like most ciphers, would be to expand a user-provided key – a password or passphrase or some other secret data – to produce a set of 18 round keys (called the ‘P array’ in Blowfish terminology) and the four 256-entry S boxes depicted above. In cryptography this expansion step is called a key schedule. In the case of the Lenovo firmware, it turns out that the keys are stored in pre-expanded form, i.e. the values of the P array and S boxes are stored in flash memory rather than the original key string. We can extract the P array and S boxes from the dumped flash image and use them for encryption/decryption. Having the encryption algorithm and keys, we can now decrypt the flasher program that is uploaded to the embedded controller when performing a firmware update. A quick Google for these numbers gives this secret away easily: this is a lookup table for a CRC-16 function with a generator polynomial of 0x1021. At this point we can be pretty sure that the algorithm is CRC-16, with only a few details to determine like initialisation value, but let me indulge myself and make a brief digression into what a CRC is and why the table looks like this. You can skip to the next section when this gets too dense for your liking. For larger messages doing this bit by bit would be slow, of course. To do it more efficiently we can pre-calculate the effect of a byte on the next sixteen bits (this will be some pattern of bit flips), for each of the 256 possible values of that byte. We then look up the first byte, XOR that in to the next sixteen bits, move to the next byte and repeat. Actually the “effect of the first byte on the next sixteen bits” is exactly equivalent to the CRC of that byte – the CRC is the pattern of bit flips that ends up past the end of a message – so the lookup table is in effect a table of CRCs of single bytes. Looking at the above examples you can verify that the CRC of 5 is indeed the entry with index 5 in the table above, and the CRC of 16 is indeed the entry with index 16. If you stare at the first example for a moment, you might see why the first sixteen entries of the table are multiples of 0x1021: all the 1 bits in 0x11021 are far enough apart that the input bits propagate independently into the CRC. Things change at entry 16 because the next 1 in the polynomial crosses over into the message. I mentioned in part 2 that a simple 16-bit checksum is also present at the very end of the firmware image. In fact, there is also a third type of checksum that we discover when we disassemble the EC boot code: four 32-bit checksums, each performed on a different area of the flash memory. The outer checksum: BIOS checks the checksum of the (encrypted) image before uploading it to the flasher. The last two bytes of the image are calculated such that the total sum of the 16-bit words of the image is zero. If this fails, flashing doesn’t proceed, so this is the least dangerous checksum to fail. The flasher checksum: The flasher calculates the CRC-16 checksum of all the decrypted bytes except the last four bytes. The penultimate two bytes of the image contain this checksum. If this checksum fails, the flasher sets a flag in flash that causes the EC firmware to fail to boot. The boot checksums: The EC firmware, at boot, calculates 32-bit checksums of four different areas of the flash. If any of these fail the EC firmware fails to boot. These checksums must, of course, also be calculated on the decrypted image. Also, for fun and so I could track my modified firmware version, I changed the embedded firmware version from “GCHT25WW” to “GCHT25MC”. I thought putting my initials in the geographic region field would be appropriate: the original suffix, WW, presumably means worldwide, while this firmware had… somewhat more limited geographic reach. Having made my changes, I wrote some small utilities to regenerate the three types of checksums – I have published these utilities on GitHub – and finally I re-inserted the modified embedded controller firmware into the BIOS update .FL2 file at offset 0x500000. If you are attempting this, make sure you check and double-check that you’ve modified exactly what you intended to modify. For Linux users, process substitution can be handy here, e.g. to get a binary diff of two files you can do: diff -u <(xxd file1.bin) <(xxd file2.bin). An update is not necessary at this time. The process has been canceled. Thwarted. I was already running the latest BIOS version and the update program did not offer an option to force an update of the BIOS or EC. Downgrading and upgrading might usually be a workaround, but I wasn’t sure that this would be possible as the Lenovo release notes mention that, “if the UEFI BIOS has been updated to version 2.63 or higher, it is no longer able to roll back to the version before 2.63 for security improvement”. Fortunately, it turns out it’s possible to run the update program manually, bypassing the limited user interface. A note: As I do not have Windows on this laptop, I am running the BIOS update program from a USB flash drive following some instructions I found online (in short: download the bootable CD image; run geteltorito -o bios.img gcuj23us.iso; write the bios.img file to the USB stick). I suspect the below process is even easier from Windows, where you can directly run winflash32.exe or winflash64.exe in place of dosflash.exe. The Lenovo BIOS update CD is just a DOS boot disk at heart. If you’ve written it to rewritable media like a USB flash drive, you can edit autoexec.bat to stop it starting the user interface, in which case it will drop you to a DOS prompt. Copyright (c) 2011-2012 Phoenix Technologies Ltd. Copyright (C) 2011-2012 Lenovo Group Limited. Read BIOS image from file. Do not turn off computer during the update!!! Total blocks of the image = 48. WARNING: System will shutdown or reboot in 5 seconds! A note here on the FL1 and FL2 files since I couldn’t find any explanation about this on the Internet: the FL1 file is a UEFI capsule file that contains the BIOS. The FL2 file contains embedded controller firmware at offset 0x500000-0x530000, the rest of it can be ignored. Why then is the FL2 file so large and why does it contain bits of an old BIOS version pasted after the EC firmware? I think partly it may be to appease the non-Lenovo-specific parts of dosflash.exe. I noticed that even though ultimately it only uses the 48 4KB blocks from 0x500000-0x530000, if I pass a file that ends there, dosflash.exe does not recognise it as a valid BIOS update file. Please do not power off! A few skipped heartbeats later, the firmware update completes. Sure enough, the system is now running my modified embedded controller firmware. It turns out that it isn’t even getting to the authentication check that I had modified, because the earlier command that sends the challenge to the battery is failing: as soon as the laptop sends command 3C and the data length indication 04, the battery is signalling NACK – not acknowledged – go away. So now I modify the state machine so that it proceeds whether or not that write command succeeds (again I do this by replacing a jump by a nop, this time in state 8). The battery installed is not supported by this system and will not charge. Please replace the battery with the correct Lenovo battery for this system. Press the ESC key to continue. Well, that’s some sort of progress: at least it is no longer displaying the original unauthorised battery message. I look in BIOS to see where these messages are coming from. Both this message and the original unauthorised battery message are displayed by LenovoVideoInitDxe.efi: don’t ask me why this code is in this module rather than somewhere more relevant (may I suggest LenovoAnnoyingBatteryMessageDxe.efi? ), but it might have been convenient to put it in the video initialisation module as the message is displayed when the screen is cleared post-POST. Anyway, in LenovoVideoInitDxe.efi it reads the battery status from the EC (register 0x38, which we came across in part 2 when decoding the ACPI tables, as well as register 0xd1 which has some additional battery status flags). Depending on certain bits in those registers, it may print one or other message. Tracing through the EC code to find where those bits are set proves difficult, so I again hook the battery up to my logic analyser. It becomes evident that the sticking point is now the second authentication sequence. I now make the same changes to the second authentication sequence as I did for the first: I prevent the write command from failing even if the battery NACKs it (state 15), and force the check of the response to succeed (state 19). This is now four changes in total, for each of which I’ve replaced a jump with a nop. After booting to this final EC firmware revision, my saga comes to an end, almost anticlimactically. My replacement battery works, and I’m getting a good few hours out of it (and no, it hasn’t burst into flames). There is still one very curious open question that I haven’t managed to figure out. There are 10 random-looking bytes at offset 0x200 of the firmware image – the start of what looks like a firmware information block – which are different in every EC revision. So far I haven’t found anything that accesses those bytes, and indeed my EC update works fine even when I leave them unchanged. Probably this is a red herring, but what these bytes are for is still a mystery. I have uploaded my utilities to GitHub so that it is possible to replicate my work and possibly make other changes to EC firmware. (Edit, Jan 2017: Hamish Coleman has built some additional utilities around my code that may also be useful, see hamishcoleman/thinkpad-ec. If you are only interested in the battery patch you will need to disable his keyboard patches.) The exact changes I made to my X230T firmware are also available as a bspatch file here. However a large disclaimer applies to all of this: do not attempt EC firmware modification at home unless you understand what you are doing. If something goes wrong with an EC update, there is a high likelihood of bricking your laptop, the only recourse being connecting to the EC via JTAG. I will not be held responsible for this. You should also understand that poor quality lithium ion cells can cause fires, as has been seen in the recent spate of hoverboard fires. I will also not be held responsible for this. I have since also torn down my old Lenovo battery, and I plan to write another post soon with some information and photos. The option of replacing the cells in a genuine battery may be worth considering as an alternative to modifying the EC firmware, the advantage being is that you can choose your own high quality Li-Ion cells versus whatever you might happen to get in a replacement battery. The disadvantage is that it inevitably results in some damage to the battery casing, and as I mentioned before the controller will remember data about the old cells which might affect function of the new cells (I will see what I can figure out on that front). To be fair, buying a genuine Lenovo battery is probably the best option for most people, at least while Lenovo is still making replacement batteries for this model. Primarily this was an exercise in ‘because I can’: I and a great many readers have enjoyed this process of diving deep into the system architecture of a modern laptop, at a level that few people are normally exposed to, and removing an annoying limitation that I feel I should be entitled to remove from my laptop. I do not have anything against Lenovo specifically – they are certainly not the only vendor who implements vendor restrictions – so please be nice in your comments. A special shout out to reddit user kernel_task who ‘worked ahead’ and worked out the encryption algorithm ahead of me posting part 3! Hey, kernel_task here. Thanks for the shout-out! I actually got interested in the question of whether or not it would be possible to derive the original Blowfish key from which the P array and the S boxes were generated. I did some boolean algebra and it turns out there is. All you would need to do is solve for the values of the P-array before blowfish is done over and over again to initialize the P-array with their eventual values, and then XOR them with the initial P-array values for the algorithm (the ones derived from digits of pi). You would then recover the key bits and by looking for repetition you can guess how many bits the key was. 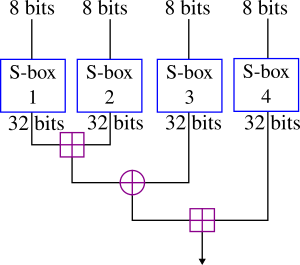 Solving for the values of the P-array before blowfish is performed can be done backwards, starting by figuring out the initial values of P and P. Those rely on the fact that the encryption to generate them uses the initial S-boxes and uses the final values of P[0-15], which are known. The only steps involving the initial values of P and P themselves is just a XOR and a swap, which could easily be reversed. Then I solve for P and P by running the encryption forward until the round requiring the initial values of P and P. Then I run the encryption backwards from the final values of P and P (which are known) until that same round. Knowing both the state before the round requiring P and P and after it means that I can figure out the initial values of P and P. This is done until I solve P and P.
Awesome job on the rest of the project! Wow, fantastic work! I thought it wouldn’t be possible to do without brute force but it turns out that I was wrong, the Blowfish key schedule can indeed be reversed using your method. I’ve verified that key indeed works. The battery installed is not supported by this system and will not charge. Please replace the battery with the correct Lenovo battery for this system. Thank you, Matthew. Now I want to buy a new Lenovo device and a different battery just to try it myself. That has nothing to do with Lenovo – that is a standard lithium battery undervoltage protection circuit kicking in. It is supposed to lock out a battery that got discharged below a safe limit, e.g. because of old age. Attempting to charge such battery could cause a battery failure – explosion, fire, etc. – so that is why this circuit disables it. When you are replacing the cells you must be aware of this circuit and keep it energized or replace it. Some can be reset as well. This function is sometimes used to hard-kill old batteries. I have a Dyson DC31 pack that, as it’s last act, discharged all the cells to around 0.5v each. Good for disposal, a right pain if trying to repack it. It’s an authenticated pack too. UEFITool author here. Very nice work, thanks for cracking that encryption. Oh hi, thank you for UEFITool. Over the years I’ve used a couple of different scripts for pulling apart EFI capsules and they’ve all had different issues/limitations, UEFITool worked for me out of the box, so thank you. My pleasure, I like when someone finds it useful. This vaguely reminds me of the time I wanted to simply watch a DVD but instead spent the next few hours hacking the Windows display driver because it disabled screen output on my (pre-HDMI) TV when DVD playback was requested. So I perfectly understand where you’re coming from, but still, this amount of effort is pretty insane 🙂 And I had an incredibly good time reading it, so thanks a lot for your detailed description! Lenovo may not be the only vendor implementing spare part restrictions, but they (presumably) are the last one to join the party, and thus currently get to bear the blame. I assume, one reason for this change is that improvements in hardware performance are slowly declining in recent years. Where you had to buy a new PC every few years to keep up with the growing demand of contemporary software, this is no longer the case now. Most business software is still happy with a core2duo system, there is no need to get the new i5 model. The only part of a laptop that is still predictably deteriorating is the battery. If it wasn’t for these pesky aftermarket battery vendors, you would be “enticed” to buy a new laptop even if you didn’t need to upgrade, simply because Lenovo stopped selling spare batteries. Seems like they have gone the most evil route to remove their market offenders from the game of milking customers. And there I am, until recently considering to switch from an HP Elitebook to Lenovo, since HP BIOS does vendor ID checks on wifi and 3G cards.. thanks to you I don’t have to anymore. Pest or cholera? Depends on the Latitude model. I have a Dell Latitude E6220 and there is a whitelist for WWAN cards. WLAN cards are unencumbered though (as of BIOS A12). I think this may be due to regulatory limitations on 3/4G hardware rather than specific malice on the part of Dell. to my understanding,thinkpad >= x250/t450 are having no whitelist anymore. i tried myself on my x250. changing the intel wifi card to broadcomm wifi card. no error on whitelist. cmiiw. Hi, you bring an exciting note to this discussion. What WLAN card did you use in your replacement? Thank you for sharing your work with us! It was a pleasure to read! BTW it’s perhaps worth mentioning that particular CRC is commonly known as CRC-CCITT (assuming it’s also initialized the same). Also, checking an appended CRC can normally done by calculating the CRC over the area including the CRC and checking the result to be zero (assuming no post-inversion). Another useful property for patching is that crc(a ^ b) = crc(a) ^ crc(b) ^ crc(0) where all inputs are taken to be the same length (xoring crc(0) is only needed if non-zero initialization or post-inversion is used). This allows updating the CRC for modifications even if part of the input is unknown. But … does the Coreboot und Libreboot folks know about your story and methods ? As far as I know they only succeeded in building new firmwares for the Thinkpads X200 and T400 so far. There are lots of people hungry to replace the Intel Management Engine and other questionable stuff from their Thinkpads (who likes “remote administration” tools which some people call backdoors ?). Lenovo a good manufacturer. But its battery on my B 560 worked just six months .. Thank you for persistence .. I am wondering if it might be a good idea to replace the checksum-checking code sections as well. When I understood correctly, the flasher program is included in the “firmware file”. So when you modify it so that it does not check the checksum of the encrypted section, you could get rid of some other steps!? The folks over at bios-mods.com produced whitelist-free bioses for the X230, but they have to be hardware-flashed because of the checksum issue, I believe. Thats exactly my thoughts.. I do have a hardware flasher but my E530 board grounds the pins in such a way I need to desolder the flashchips. Anyway, people want to remove whitelists, remove Intel ME and install core/libre-boot. I think based on bios-mods.com that the bios flash updater used crc and encryption on parts of the normal bios (UEFI) aswell. and only somewhat after 2.5 (lenovo) changed to only update .efi files that needs updateing. but I might be mistaken. What this does make it intrestingly is would this allow me to fix a crc bug I have in my bios and change a .efi file with a older version? (say, replace the whitelist efi file or the battery check file LenovoVideoInitDxe.efi? My modifications have been entirely on the embedded controller side (the FL2 file), I haven’t needed to modify the BIOS (the FL1 file, the part that runs on the main processor). I suspect that programming an unauthorised BIOS could be more difficult. And the _really_ sad part. Lenovo, had they wanted to be customer friendly instead of hostile, could have simply dropped the charge rate down from “super fast charge” to the regular slow “trickle” charge that every other laptop performed up until the “invention” of the super fast charging. You put in a battery that ‘authenticates’ – you get the high speed charging. You put in a battery that does not authenticate – you get the old slow trickle charging. But no, they took the customer hostile route instead. FYI your publications will not download in Android cgrome due to html compatibility problems. I couldn’t reproduce this on my Android phone, but I’ve fixed the website so it now passes the W3C validator, so hopefully it will now work! Let me know if you still have issues. You did an awesome job! I hope you inspire more people! I have another issue. ASUS laptop always charges battery up to 100%. How to stop charging at 90% for prolong life ? There is no software from ASUS to do that. Awesome work. What about your utilities? Awesome write up – looking forward to the teardown of the Lenovo battery write up. I m not sure, but I doubt that there are laws against not charging unauthorized batteries. I am fairly sure that they could be held liable for any damages caused by fires, etc caused by trying to charge a poorly-made battery, and that you cannot release that liability with any kind of boot-up message or contract. Great work, is it possible to replace the keyboard rom with that from previous xx20 series, so that the xx30 could get the classic thinkpad keyboard instead of the chiclet keyboard. Willing to donate if it can be done. It’s not quite as easy as copying a keyboard ROM, as far as I know the keyboard code is part of the embedded controller code and you can’t install xx20 EC firmware on xx30, but I think it should be possible to change the keyboard maps in the xx30 EC firmware if that turns out to be all that’s required. Just so I’m clear what you want to do, are you looking to physically install an X220 keyboard into an X230 (say)? I, too, am interested in changing the x230 EC keyboard map. However, following along with your artivle, I looked at a JTAG dump of the EC firmware and was not able to find the same keyboard map table – so now I am a little more confused than I started out. wdbryan, I have just done this and can report partial success. -00219a0: 0000 0000 0000 0000 0000 0000 003c 003e …………. +00219a0: 0000 0000 0000 0000 007c 7d00 003c 003e ………|}.. I now have PgUp and PgDn in the right spot and a couple of other improvements. However, PrtScr, ScrLk, Pause, Insert and Home all still dont respond. There is no immediately obvious pattern here (they are not all on the same row or column), so I clearly need to do some more checking. You probably changed only the main array. May I ask your email? Got something related, may be useful. any hint on what i should do to make it works? The X250 .FL2 has the image at a different offset (0x20 rather than 0x500000 – they’ve done away with the large amount of padding and just have a short header on the front). However even with that fixed I don’t think my method will work for X250. It looks like the X250 EC image is encrypted with a different key, and it looks like it may be signed (there’s 256 extra bytes on the end that may be a signature). At the very least one would need to work out the encryption key from an X250 EC flash dump, and if the BIOS verifies the signature then it might be significantly more difficult to flash a new EC image. Thanks again for your work Matthew! Once we could decrypt and reflash the firmware with your software, a couple of us were able to replace the xx30 keyboard with a classic keyboard and keep all its functionality. Hi, would simply installing Coreboot be a good workaround to this problem or would it not help? This article is the only info confirming lenovo blocking batteries in thier bios i could find. I found it because I bought a genuine lenovo battery for my B5070. The original battery is tiny at 32W. The hardware manual lists 2 batteries as compatible that are larger at 41W. So I went ahead and bought one from a 3rd party seller (no batteries for the B5070 are available for sale at lenovo online). But it doesnt charge. I get no warning at boot, only in Lenovo settings does it say that 3rd party or un-authorised batteries will not charge. I called Lenovo and I was informed that unless I purchase the exact model batter that came with my laptop (regardless of what Lenovo documentation says) there will be a high chance that it will not work. I had already got my bios modded at mydigitallife to enable using a different wifi card, does this work by Matthew mean that it should be possible to get a bios mod somewhere to allow me to use this new 41W battery as opposed throwing it out? I don’t think I could recreate his work on my own. I wait for the next article about the battery tear down. Fantastic hack/writeup! I’ve been searching the web, trying to find the knowledge to patch the EC firmware on my own computer to fix a small set of issues, and there really aren’t a whole lot of other detailed, yet easy-to-understand articles like this series. So, thanks for helping fill that void. Interested in doing the same (battery unlock) for my recently acquired T430s – found the schematic for the T430 and it shows the same EC – MEC1619. Need to confirm that the T430s has the same, but I think it’s a good chance. I’m interested in retracing your steps and don’t currently have a logic analyzer – looks like they stopped selling the USBee SX. I’ve worked on a Coreboot port in the past and plan on evaluating the state of the T430/T430s ports as well, not interested in deblobing / removing ME though. Thanks a lot for posting this useful information and code! I have a Dell Latitude E6420, where an ECE5026 is responsible for controlling the eSATA port’s power rail. There is an another embedded controller on the mainboard a MEC5055. These two chips are connected together via BC-Link bus and each seems to be accessible through LPC from the host. I have not found any public documentation about these chips. Do not you have accidentally any information about the MEC5055 architecture? Does this mean we can use X220 batteries in X230 with this modded EC? Nice hack. I went down on a different road. I hacked the battery instead and found out (in my case) it’s a modified ti chip with a modified firmware. So it’s not working at least not 100% with the official ti software and ev2300/ev2400 interface. After I found out I made a vga-i2c adapter then on linux i wrote some userspace c code to interact with the smbus and of course download and upload the flash program and eeprom memory. In the result I brought back my original totally dead battery(cleared flags/reseted cycle count/remaining capacity) and I can still use around ~60% of the original capacity or i can say the designed capacity! Amazing work. I was about to return a battery I just bought. Thank you. Really nice work here. Thank you for the information. I’ve been trying to mod my X230 BIOs. Thus far I have removed the WIFI whitelist and unlocked advanced BIOS options. I’m trying to remove the battery check and I will be trying your code to see if I can manage it. Would you be willing to share your modified BIOS so that I can “reverse engineer” it and see where you made your changes? Check out the link to Hamish Coleman’s github near the end of the post, there are patches for X230 in there. Note that I only modified the embedded controller firmware and not the BIOS as such. So you’ve successfully managed to remove the WIFI whitelist? Very cool! Would you be willing to share how you’ve done it? This bugs me to no end on my X230i. big thanks from germany. 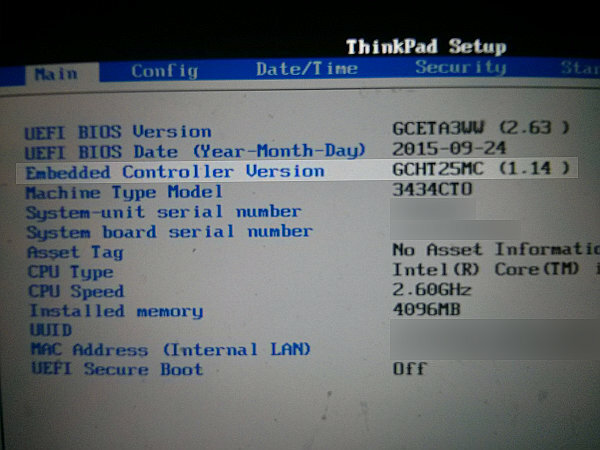 just updates my t430 to the current version – t430 BIOS 2.72 (G1ETB2WW) EC 1.13 (G1HT35WW) – works absolutely fine. Now my 3. party 90++ battery is working as expected. Thank you for this impressive write up and analysis of reverse engineering and patching of the firmware. You skills are highly impressive. I thoroughly enjoyed reading through your articles. I ran this patch on a T430, using hamishcoleman/thinkpad-ec script and it worked perfectly. (Not that I had any doubt after reading the imense amount of work went into succefully solving the issue, but I wont say I wasn’t nervous the moment of running the update). is anyone aware of any open source tools to read and write the internal flash of the MEC1619? Up to now, I’ve found references to SVOD programmer and JTAG Tiny Tools only. I’ve got a RaspberryPi and a Bus Pirate already on my desk, both are supported by e.g. OpenOCD. I assume I’ve fried the MEC firmware of my W530 (independently from the above changes). Oddly, if I mount the 6.6MB iso, I find the files below (totalling 5.0MB), but if I run `geteltorito -o 7luj27uc.img 7luj27uc.iso`, the .img file is only 1.5MB and contains a shorter list of completely different files (totallying 174KB). Image has been written to file “7luj27uc.img”. If the .iso is somehow representing itself to geteltorito as a floppy, I could see the resulting 1.44MB image; but why then is the mounted .iso not revealing the AUTOEXEC.BAT, or any of the other files, save COMMAND.COM? Hi Matthew – wondered if you can give me some advice. I’ve got T430 and have a 27++ battery slice for it which doesn’t have the auth chip T430 looks for. Have flashed EC with Hamish’s utility and had battery validation active but it hasn’t worked, I suspect because this battery uses the dock port . There are exposed battery pins next to the dock plug on the battery so it would be easy to connect onto the SCL and SDA pins and I could get a USB logic analyser … then I’d get into stuff way way over my head. Do you know anyone who has worked on such a thing who might be able to help? Maybe they have a working image I could use.